The SoundOut object as it appears in the Toolbox. The SoundOut object is used to present pre-recorded audio sounds. The SoundOut object maintains and manages a buffer on a specific sound device. A new SoundOut object may be opened by clicking the SoundOut object icon in the Toolbox, and dragging the object to the Workspace or to a procedural timeline in the Structure. The SoundOut object does not have an interface through which properties are set. Dragging the SoundOut object icon to the Workspace, or double clicking a SoundOut object in the Structure view will open the object’s Property pages. 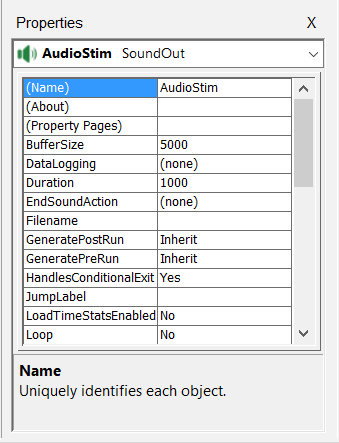 The properties for the SoundOut object may be set using the Property pages. 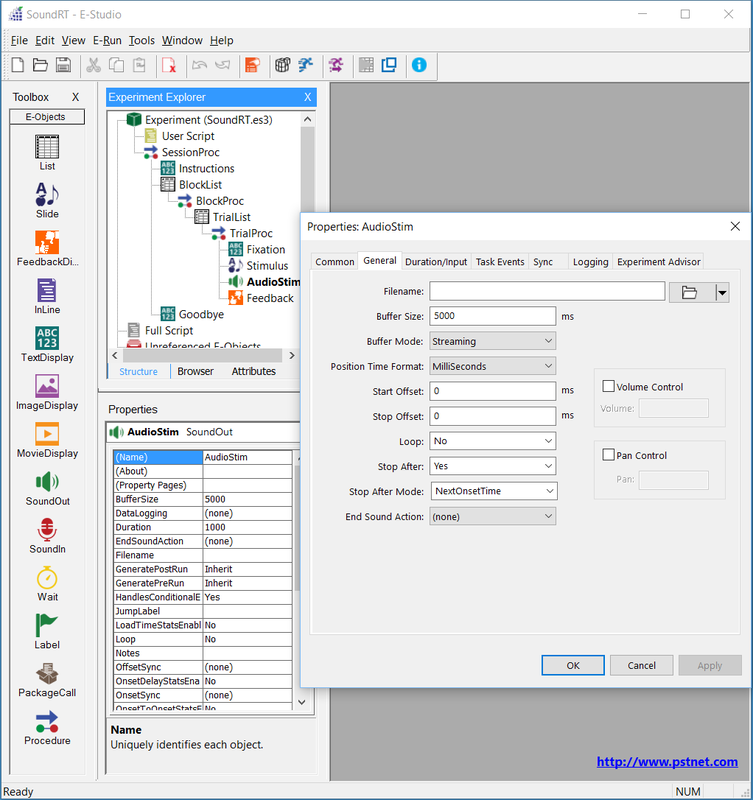 The Property pages may be displayed by double-clicking the SoundOut object in the Structure view, or by clicking the elipses (…) in the Property Pages field in the Properties window. The General tab permits the setting of properties related to the audio file presented by the SoundOut object. Filename Strings, Attribute references Determines the audio file to be loaded by the SoundOut object. BufferSize Integer values Determines the size of the audio buffer in milliseconds. Determines whether the sound is preloaded in it's entirety or streamed in. Streaming is recommended. PositionTimeFormat MilliSeconds, MicroSeconds, Bytes Specifies the time format that CurrentPosition, StartOffset, and StopOffset will use. StartOffset Integer values, Attribute references Determines the offset (in bytes) from which audio playback will begin. StopOffset Integer values, Attribute references Determines the offset (in bytes) at which audio playback will terminate. Loop Yes, No Sets playback to loop continuously between the StartOffset and StopOffset property settings. StopAfter Yes, No Determines whether the playback will continue after the termination of the SoundOut object’s Run method. Indicates whether sound capture should end when the object stops executing (e.g. the time specified in the Duration property has elapsed). EndSoundAction (none), Terminate, Jump Determines the action to be taken upon termination of the playback. VolumeControl Yes, No Enables or disables control of the volume level for playback. Volume -10000 to 0 Sets the volume level for playback. PanControl Yes, No Enables or disables panning control for playback. Pan -10000 to 10000 Sets the panning level (i.e., balance) for playback. The Properties of the SoundOut object may be set using the fields in the Properties window. Properties to be set include information concerning the features of the SoundOut (e.g., PanControl, Volume), as well as the duration of the SoundOut, whether input is allowed, and the termination conditions for the playback of the SoundOut. (Name) String values Assigns a user-entered string as the name of the SoundOut object. (About) --------- Displays the About SoundOut dialog. (PropertyPages) --------- Opens the Property pages for the SoundOut object. DataLogging None, Standard, Response Only, Time Audit Only, Custom Determines the category of variables to be logged by the object. Duration -1 (forever), Numeric values Determines the duration of the object in milliseconds. EndSoundAction (none), Terminate, Jump Determines the action to be taken upon termination of the audio playback. Filename String values (e.g., Filename.WAV), Attribute references. Designates the name of the audio file to play. Loop Yes, No, Attribute references. Determines whether the audio playback continues in a loop, or stops at the end of the data playback. Pan Numeric values, Attribute references. Specifies the pan level in 100th decibels. Functionality is dependent on the PanControl property setting. PanControl Yes, No Enables or disables panning control. PreRelease Numeric values (default in msec), Attribute references. Amount of time released during the processing of the current object to allow for set up of the next object. SoundMode Streaming, Buffered Determines if the buffer is fixed or permits streaming. StartOffset Specific string values (e.g., "0"), Attribute references. Determines the offset (in bytes) from which audio playback will begin. StopAfter Yes, No, Attribute references. Determines whether the playback will continue after the termination of the SoundOut object’s Run method. StopOffset Specific string values (e.g., "0"), Attribute references. Determines the offset (in bytes) from which audio playback will terminate. TimingMode Event, Cumulative, Custom Sets the timing method to be used by the object.Cumulative timing is used to absorb the processing time between events, and to maintain a certain interval duration between events or betweentrials. Volume Numeric values, Attribute references. Sets the volume of the SoundOut buffer. Currently specifies 100th decibels. Functionality is dependent upon the VolumeControl property setting. VolumeControl Yes, No Enables or disables volume control by the SoundOut object. StopAfterMode may be set to one of two values: OffsetTime and NextOnsetTIme. The OffsetTime value mimics the functionality used in earlier versions of E-Prime . When StopAfterMode is set to OffsetTime, then StopAfter will stop the Movie/Sound when the object that invoked it ends. The OffsetTimes choice is no longer recommended because of how it is impacted when PreRelease is set to a non-zero value. In these cases, the movie or sound could be cut off prematurely; further, when PreRelease = “same as duration”, then the movie or sound could not be presented at all. The NextOnsetTime choice provides the benefits of having a non-zero PreRelease value by stopping when the next object begins. Note that in both E-Prime 2 and E-Prime 3, when you change Position Time Format it immediately also changes the format shown for Start Offset & Stop Offset (ms, µs, or bytes), but when you close the dialog and reopen it it will always show ms, even though Position Time Format stays where you set it.